Nose piercings are a unique way to adorn your body and advertise your uniqueness, but they do come with certain risk factors, including a nose keloid. While nose keloids won't happen to everyone that gets pierced, there are certain risk factors and treatment options that you should be aware of before putting a ring in it. Maybe you got your nostril pierced, or possibly your septum, and you've been following all the aftercare instructions. Your piercing was healing beautifully, but a few days ago, you noticed a shiny raised bump next to your nose ring. While this might be a very concerning sign of an infection, it could also be a keloid. Why Do People Get Body Piercings? According to the American Academy of Dermatology (AAD), a keloid is a raised scar that forms around a minor or major skin injury like a piercing. This is an abnormal type of healing where the fibrous tissue that creates the scar grows out of control and can extend beyond the area that was pierced. Keloids can develop rapidly or take months to develop, and they can enlarge over the years. Nose keloids can be tricky for you to self-diagnose because they can be similar to other types of skin problems. You might experience pain or tenderness in the lump, and it can also itch, which are common occurrences among infections from unsterilized equipment and allergic reactions to specific metals or cheap jewelry. Therefore, you should see a dermatologist or doctor if you develop a lump. There are, however, some distinct symptoms of a nose keloid. Unlike an infection or allergic reactions, a keloid can develop slowly over time. It might not appear when you first get the piercing in your nose, but grow slowly over months or even years. Around a piercing, a keloid is typically a solid mass with a smooth, shiny appearance, and pink, purple, or brown in color. It will also be fixed in place and typically feel hard and rubbery, according to Harvard Health Publications. Keloids are bothersome and can cause unsightly scarring, but according to Julius Metts in the Western Journal of Medicine article Common Complications of Body Piercing, they aren't common in all people. 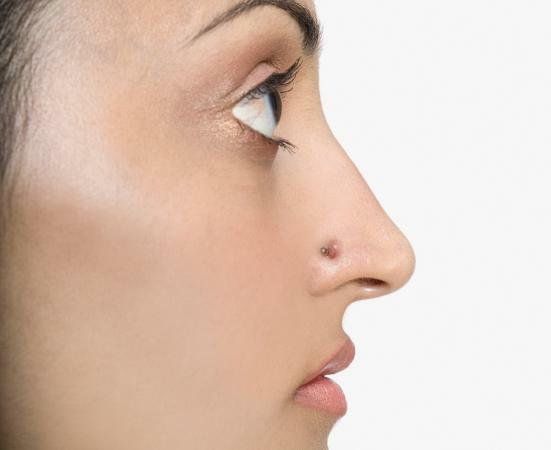 There are several risk factors that can increase your likelihood of developing a nose keloid, including your heritage, family history, and age. Heritage: People with darker skin tones like those of African or Hispanic descent are more likely to develop a keloid, according to Metts. Family History: The AAD stated that 1/3 of people who get keloid scars have an immediate family member (mother, father, or sibling) with a keloid. Age: The AAD also specified that the peak time for getting a keloid was between the ages of 10-30, with most happening to people in their 20s. There are ways that you can treat a keloid once it develops, but the only way to prevent a keloid from a nose piercing is to not get the piercing at all. Therefore, if you have a family relative with a keloid or have a darker skin tone, you will want to seriously take this into consideration before you visit your local tattoo parlor. It should also be mentioned that the nose isn't listed as a major body area prone to keloids, like the ears, cheeks and chest; however, nose keloids still happen and can cause unsightly scars that might cause pain and emotional distress. Maybe you didn't know about your family history or you decided to risk it and a keloid has developed. There are several treatment options that are available if this occurs. Depending on your keloid and your doctor, you might have to try out several to find the one that works best for you. Corticosteroid shots: A dermatologist might give you a shot directly into the scar to help to shrink it. The AAD stated that about 50-80 percent shrink after injections. These injections can last several weeks. This is typically the first line of attack used by your dermatologist in treating this condition. Cryotherapy: In this treatment, a dermatologist might freeze the nose keloid to reduce the size of a smaller keloid. Silicone gel: This is applied to the keloid to help shrink it. It can work effectively to flatten little nose keloid scars. Compression dressings: While uncomfortable, these apply pressure to the keloid, shrinking it. There are even special rings available to aid in this purpose. Surgery: Your dermatologist may surgically remove the keloid then use pressure or dressings to help to prevent its return. This can be problematic because the additional wound may also develop a keloid. While these are the most common treatments, there are other treatments as well, including radiation to shrink the scar, laser removal, and ligature. Ligature is where thread is tied around the keloid, gradually cutting into it, which will cause it to fall off. No matter what treatment you use to treat a keloid, remember not every treatment works for everyone and it takes time and patience to get rid of keloid scars. 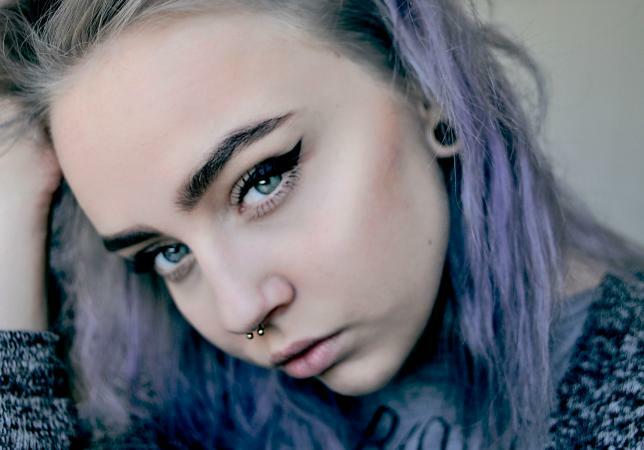 Keloid scars can happen on any body piercing, but a nose keloid is rather difficult to hide. While there is not a way to prevent a nose keloid, beyond not getting pierced, there are several risk factors that might make you more susceptible to a keloid, like heritage and age. No matter what you decide, remember that if you do get a keloid, there are options available for treatment. Above all, remember you are beautiful no matter what, so consider your choices and talk to your piercer before hopping in that chair.